Summary, Analysis, and Review of Danny Meyer's Setting the Table: The Transforming Power of Hospitality in Business PLEASE NOTE: This is a key takeaways and analysis of the book and NOT the original book. 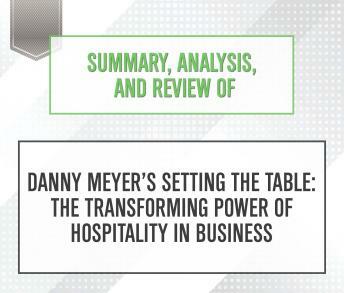 Start Publishing Notes' Summary, Analysis, and Review of Danny Meyer's Setting the Table: The Transforming Power of Hospitality in Business includes a summary of the book, a review, analysis & key takeaways, and a detailed About the Author section. PREVIEW: Setting the Table: The Transforming Power of Hospitality in Business is the autobiographical account of Danny Meyer, a world-famous restaurateur. The owner of an eclectic group of eateries, including Gramercy Tavern and Shake Shack, Meyer draws on his twenty-one years of experience in the industry to describe the unusual business values that underpin his wild success, including hospitality, which stems from the basic human need for food and family.